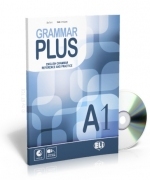 Grammar Plus A1 - English Grammar Reference and Practice + CD audio Grammar Explanations and Exercises Levels Beginner –Intermediate CEFR A1 – B2 A series of manuals to review and practise English grammar, carefully graded to the levels of the Common European Framework of Reference. Organised in order of increasing difficulty, each unit presents a...more..
Grammar Plus A2 - English Grammar Reference and Practice + CD audio Grammar Explanations and Exercises Levels Beginner –Intermediate CEFR A1 – B2 A series of manuals to review and practise English grammar, carefully graded to the levels of the Common European Framework of Reference. Organised in order of increasing difficulty, each unit presents a...more..
Grammar Plus B1 - English Grammar Reference and Practice + CD au Grammar Explanations and Exercises Intermediate CEFR B1 A series of manuals to review and practise English grammar, carefully graded to the levels of the Common European Framework of Reference. Organised in order of increasing difficulty, each unit presents a clear explanation of the grammar...more..
Grammar Plus B2 - English Grammar Reference and Practice + CD au Grammar Explanations and Exercises Intermediate CEFR B2 A series of manuals to review and practise English grammar, carefully graded to the levels of the Common European Framework of Reference. Organised in order of increasing difficulty, each unit presents a clear explanation of the grammar...more..
Grammar Plus A2 + CD audio About the series Grammar Plus: These workbooks contain sets of graduated grammar exercises, subdivided according to their subject. Each of these series of exercises is preceded by a concise but complete theoretical summary. Some of the exercises themselves...more..
Grammar Plus B1/1 + CD audio About the series Grammar Plus: These workbooks contain sets of graduated grammar exercises, subdivided according to their subject. Each of these series of exercises is preceded by a concise but complete theoretical summary. Some of the exercises...more.. Junior Workbook 2 - Elementary level + CD is designed for young pupils who require extra exercises to consolidate the English learnt at their second year of school. Each unit contains a very brief summary of the language point and abundant exercises ranging from very simple to the slightly more difficult. Activities include question-answer exercises, gap-filling, multiple...more..
Grammar Revision - Elementary 2 + CD is designed for young pupils who require extra exercises to consolidate the English. Each unit contains a very brief summary of the language point and abundant exercises ranging from very simple to the slightly more difficult. Activities include question-answer exercises, gap-filling, multiple choice as well as word games,...more..
Grammar Revision Keys Beginner, Elementary 1, Elementary 2 Tape-scripts and keys to all the exercises of the worksheets: Grammar Revision Beginner Workbook + CD audio Grammar Revision Elementary 1 Workbook + CD audio Grammar Revision Elementary 2 Workbook + CD audio 30 pages 21x29,7cm ISBN 9788846820563more..
Grammar Revision - Pre-intermediate + 2CDs is designed for young pupils who require extra exercises to consolidate the English. Each unit contains a very brief summary of the language point and abundant exercises ranging from very simple to the slightly more difficult. Activities include question-answer exercises, gap-filling, multiple choice as well as word games,...more..
Grammar Revision Pre-Intermediate Workbook 1, 2 Keys Tape-scripts and keys to all the exercises of the worksheets: Grammar Revision Pre-Intermediate Workbook 1 + CD audio Grammar Revision Pre-Intermediate Workbook 2 + CD audio 46 pages 21x29,7cm ISBN 9788846813770more..
Grammar Revision - Upper-intermediate + CD is designed for pupils who require extra exercises to consolidate the English. Each unit contains a very brief summary of the language point and abundant exercises ranging from very simple to the slightly more difficult. Activities include question-answer exercises, gap-filling, multiple choice as well as word games, puzzles...more..
Grammar Revision - Advanced + CD is designed for pupils who require extra exercises to consolidate the English. Each unit contains a very brief summary of the language point and abundant exercises ranging from very simple to the slightly more difficult. Activities include question-answer exercises, gap-filling, multiple choice as well as word games, puzzles and...more..
English Focus on Grammar - Starter 1 + CD provides both a systematic and fun approach to English for young students at starter level. Each unit begins with a summary of the new vocabulary and structures and is followed by entertaining exercises and games designed to make learning and speaking English an enjoyable experience. Activities include basic vocabulary and simple...more..
Focus on Grammar - Starter 2 + CD provides both a systematic and fun approach to English for young students at starter level. Each unit begins with a summary of the new vocabulary and structures and is followed by entertaining exercises and games designed to make learning and speaking English an enjoyable experience. Activities include basic vocabulary and simple dialogues and...more..
Focus on Grammar - Starter 3 + CD provides both a systematic and fun approach to English for young students at starter level. Each unit begins with a summary of the new vocabulary and structures and is followed by entertaining exercises and games designed to make learning and speaking English an enjoyable experience. Activities include basic vocabulary and simple dialogues and...more..
English Focus on Grammar Keys Starter 1,2,3, Beginner Keys to all the exercises of the worksheets: English Focus on Grammar Starter 1 + CD audio English Focus on Grammar Starter 2 + CD audio English Focus on Grammar Starter 3 + CD audio 16 pages 19x26cm ISBN 9788849300550more..
Focus on Grammar - False beginner + CD provides both a systematic and enjoyable approach to English grammar for students at false beginner level. Each unit begins with a summary of the main grammar points and its followed by practice exercises designed to check student understanding. Activities are exam oriented and include examples of sentence transformation, verb transformation,...more..
Focus on Grammar - Elementary 1 + CD provides both a systematic and enjoyable approach to English grammar for students at elementary level. Each unit begins with a summary of the main grammar points and its followed by practice exercises designed to check student understanding. Activities are exam oriented and include examples of sentence transformation, verb transformation,...more..
Focus on Grammar - Pre-intermediate + CD provides both a systematic and enjoyable approach to English grammar for students at pre-intermediate level. Each unit begins with a summary of the main grammar points and its followed by practice exercises designed to check student understanding. Activities are exam oriented and include examples of sentence transformation, verb...more..